How long does it take you to fall asleep? Dozing off can be a challenge when your brain can’t seem to stop buzzing. There are many methods you can try to quiet your mind and get a good night’s rest. One of the most popular ones — and one of the easiest to start — is meditation. Meditation can refer to a variety of techniques and traditions. You might have already heard of one: Zen meditation. We’ve come to equate “zen” with a sense of balance, and zen meditation strives to bring that peace of mind to your everyday life. The good news is that you don’t need a guru, a monastery, or a waterfall to get started. You can find tons of resources online to help you cultivate a personal practice. This is a great starting point for exploring zen meditation. 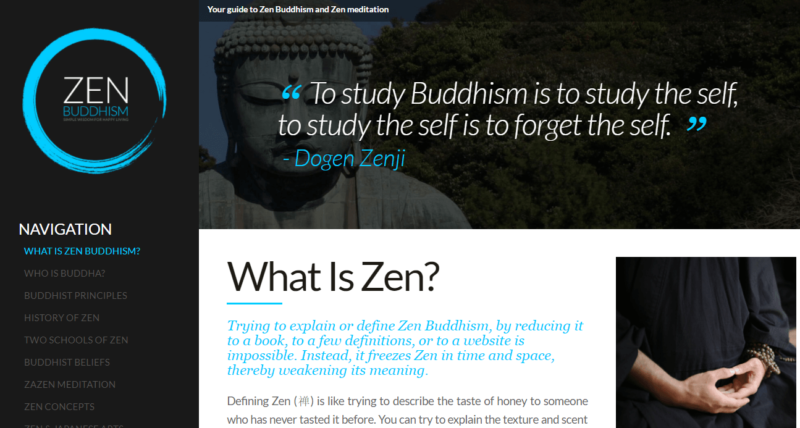 Zen Buddhism is a simple website that introduces you to the basics of Zen Buddhism, from the practice of meditation to the core beliefs that inform the Zen Buddhist tradition. All the information comes in short, digestible articles and quick FAQ-style answers; you also get links to more resources, especially for the different schools of Zen. The site’s worth a visit even if you’re not looking to explore the philosophical or spiritual side of zen meditation. Consider it your thorough, accessible crash course. If Zen Buddhism is your crash course, The Zen Site is your intermediate program. 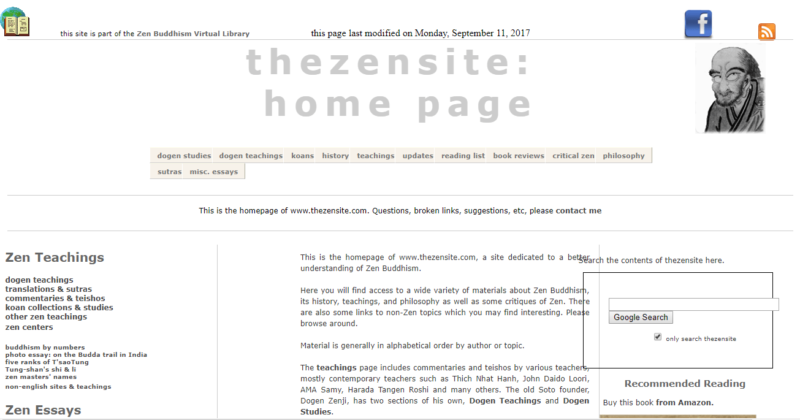 Don’t let the site’s plain, sometimes-glitchy layout fool you: this is an extensive repository of Zen Buddhism resources, from koan collections to commentaries and essays on zen practices and traditions. You’ll also find a great reading list to guide further explorations into Zen Buddhism, plus a handy directory of Zen centers, sites, and masters. Wildmind adheres more to a general Buddhist approach than a specifically Zen one, but it’s still a great read. Here, you’ll get into the nitty-gritty of a meditation practice through detailed meditation guides. You’ll find a whole series of articles dedicated to meditation posture, for example, with checklists for different positions (sitting, kneeling, standing, etc.) and guidelines for your head, neck, shoulders, and so on. Similar guides exist for breathing, as well as for specific techniques like using a mantra while you meditate. If you find yourself asking whether you’re “doing things right,” this is a great site to check out. 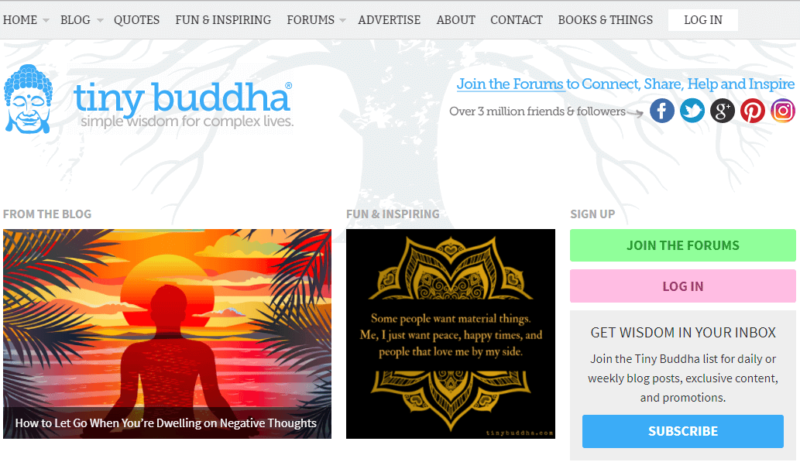 Wildmind Buddhist Meditation is also included in our Top Meditation Blogs. We like Tiny Buddha for its broad scope. Instead of focusing on meditation, Tiny Buddha helps bring the zen mindset to every aspect of your life. The main blog covers topics like love, work, and relationships. You’ll find posts with tips for cultivating a mindset of gratitude or regulating negative thoughts, prompts for daily reflections, and more. The site also houses inspirational quotes and images, plus a community forum where you can connect with other practitioners. Like Tiny Buddha, Zen Habits is all about incorporating your zen meditation practice into your daily life. 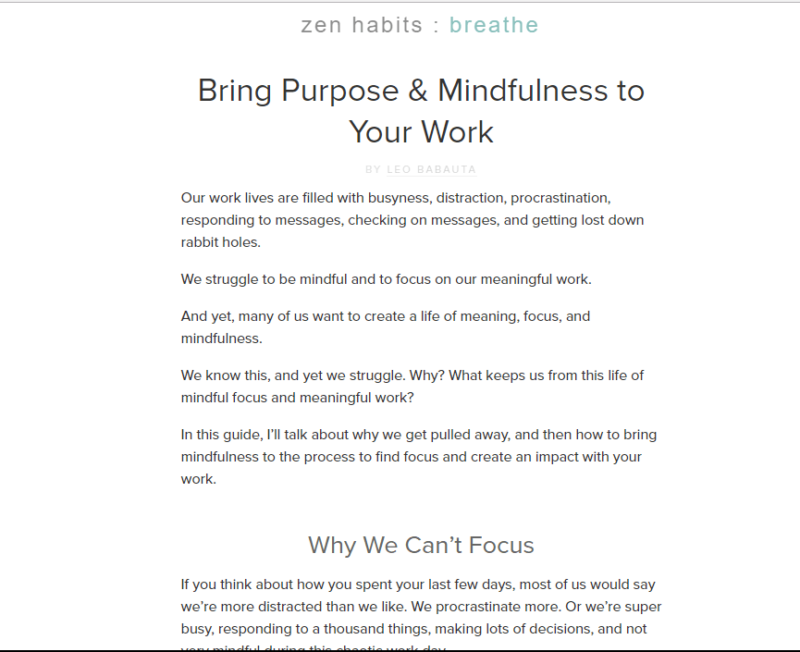 Run by Leo Babauta, Zen Habits sets itself apart with its personal approach: Leo’s posts are always informed by his own experiences, his own experiments with implementing different zen-informed changes to his routine. We love how Leo translates his insights into practical suggestions that you can act on. The blog has been around for a while, so there’s lots of material to go through. Luckily, there’s a quick-start guide for new readers. It never hurts to have a mentor. If you don’t have a friendly neighborhood monastery to visit for guidance, you can check out Jack Kornfield’s blog. 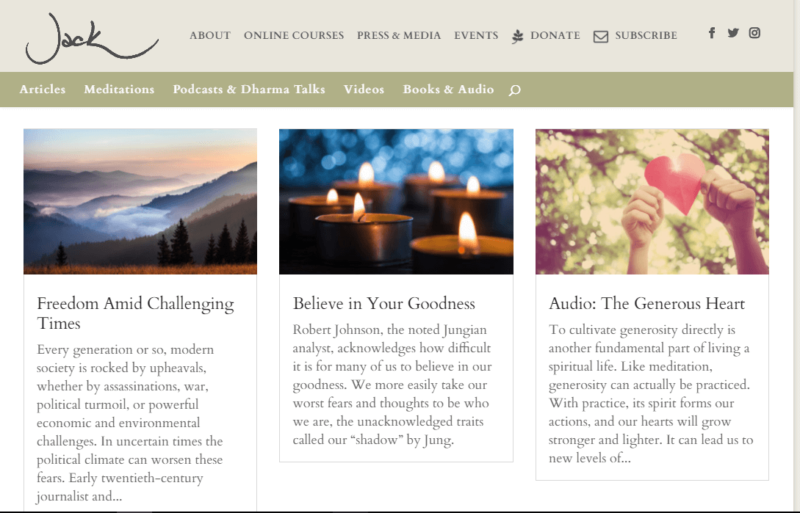 One of the foremost teachers of Buddhist meditation practice in the West, Kornfield fills his site with insightful articles designed to help you cultivate a more balanced, peaceful mindset. He tackles topics like letting go of anxieties, confronting fears, and so on. You’ll also find audio and video meditations, podcasts and talks about Buddhism, and books to help you deepen your practice. Bear in mind, though, that Kornfield’s approach is anchored on the spiritual aspects of Buddhism. If you’re looking to cultivate a more secular practice, stick to the other items on our list. The Endless Further is more of a personal site dedicated to Buddhist meditation, and it’s a great stop if you want reflective pieces on sustaining a zen mindset. 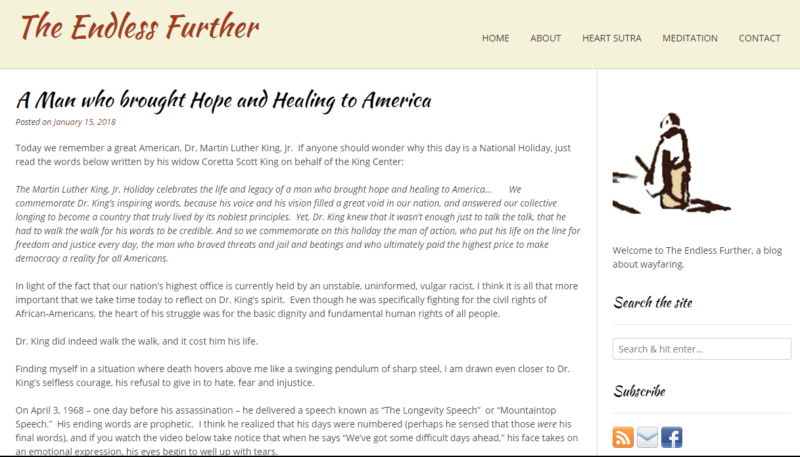 The site is run by David Riley, a Buddhist meditation teacher. His approach combines different Buddhist traditions, including zen. You won’t find a lot of practical guides or suggestions, but if you’ve been looking for someone who can help enrich the more contemplative side of your meditation practice, this is the blog to check out. 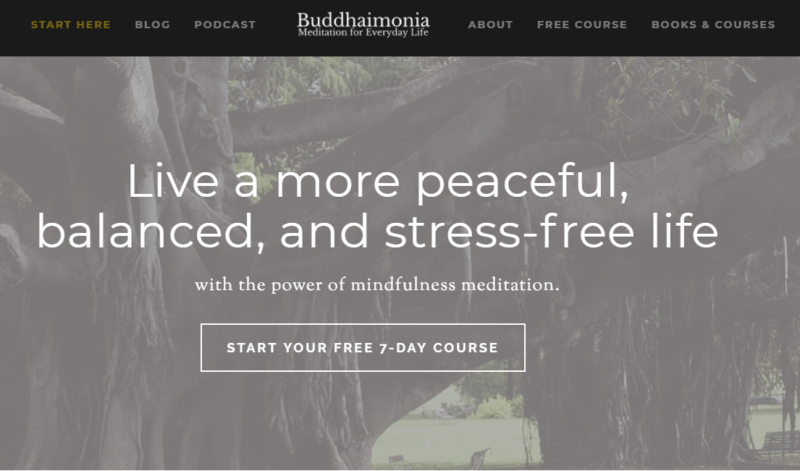 Buddhaimonia is run by meditation teacher Matt Valentine, and it’s a great alternative if you want a more youthful, secular meditation resource. Valentine’s blog takes an instructional tone, with posts designed to help beginners explore new techniques and establish new routines or daily rituals to support their meditation practice. Our favorite section, though, is Valentine’s podcast. Most episodes are either how-tos that tackle how meditation can help you achieve certain goals (e.g., being kinder to yourself or more productive at work), or guided meditations to help structure your sessions. 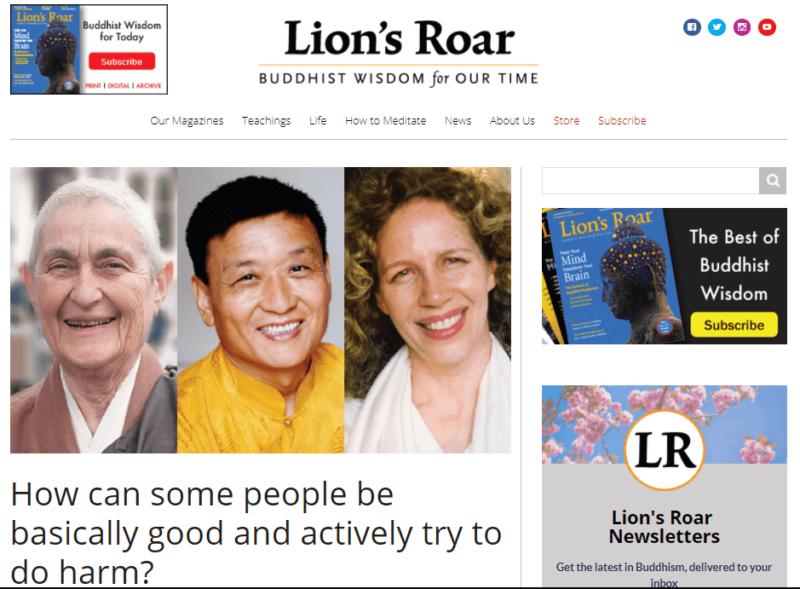 This is the online home of the Lion’s Roar Foundation, a nonprofit dedicated to making Buddhist teachings and practices more accessible to the general public. 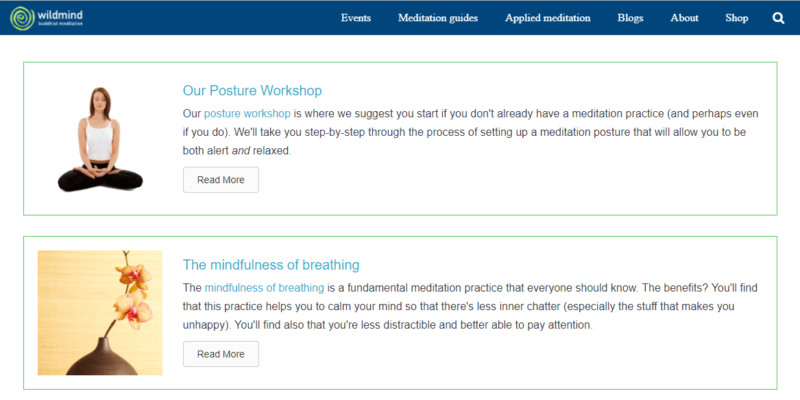 There’s a whole section dedicated to learning how to meditate, complete with supplementary material like videos and audio guides. Despite the Foundation’s purpose, its meditation resources are fairly practical, and you can learn a lot without necessarily diving into the deeper philosophies of Buddhism. Lion’s Roar also features news on the wider Buddhist community, complete with a magazine and a quarterly journal. If you’re committed to making meditation and Buddhism a bigger part of your life, this is a great online hub to plug into. Wisdom Publications is another institution-run online resource for learning about Buddhism and its practices, including meditation. Like Lion’s Roar, Wisdom Publications has a broader scope, covering news and resources related to different schools of Buddhism. The blog features advice, commentary, and guidance from recognized masters, including the Dalai Lama. You’ll also find a long-running podcast series featuring interviews with leading Buddhist thinkers, plus a collection of structured courses to help you learn more about Buddhist teachings and practices. If you’d like an authoritative guide to the spiritual depths of Buddhist meditation, this is a great place to start. Do you ever find yourself wishing you could talk to a friend about your budding new Zen practice? If none of your friends have gotten into zen meditation yet, Wild Fox Zen can happily step in. This blog features posts from someone who’s learning about Zen Buddhism, too, and you’ll find posts on Zen history, beliefs, and traditions. We love that it’s all written in a fun and conversational tone — if Zen has always sounded intimidating to you, this is the blog that can convince you otherwise. Wild Fox Zen is a great companion if you’re looking to deepen your understanding of Zen meditation, and it’s a good gateway to the larger network of Zen Buddhist writing on the Patheos site. 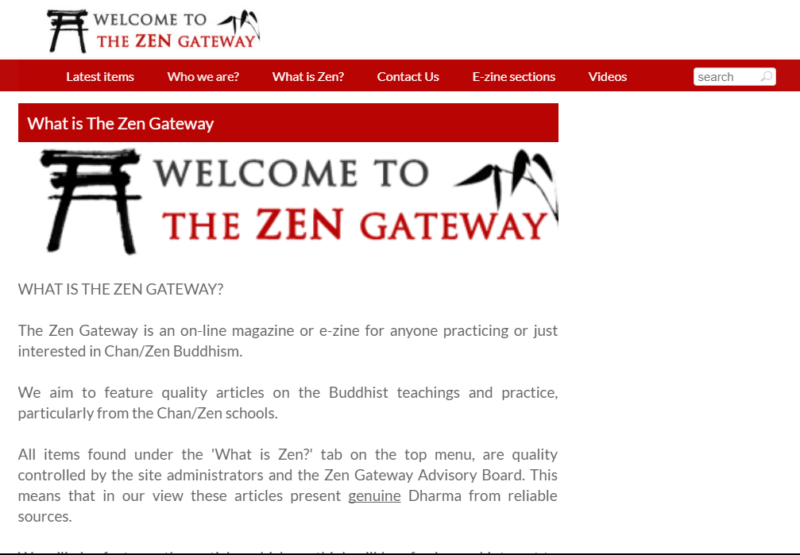 Speaking of gateways, Zen Gateway is a self-described “e-zine” for people who want to learn more about Zen Buddhism. The houses some great resources for Zen Buddhism beginners. Our favorite section is the Zen Bites podcast, where you’ll find 20 episodes on the different techniques you can use to incorporate zen into your life. There’s an episode dedicated to zazen or sitting meditation, and if you want to branch out, you can also check out episodes on mantras and chanting, mindful eating and drinking, walking meditation, and more. Here’s another blog that takes a more personal approach to exploring Zen practices. 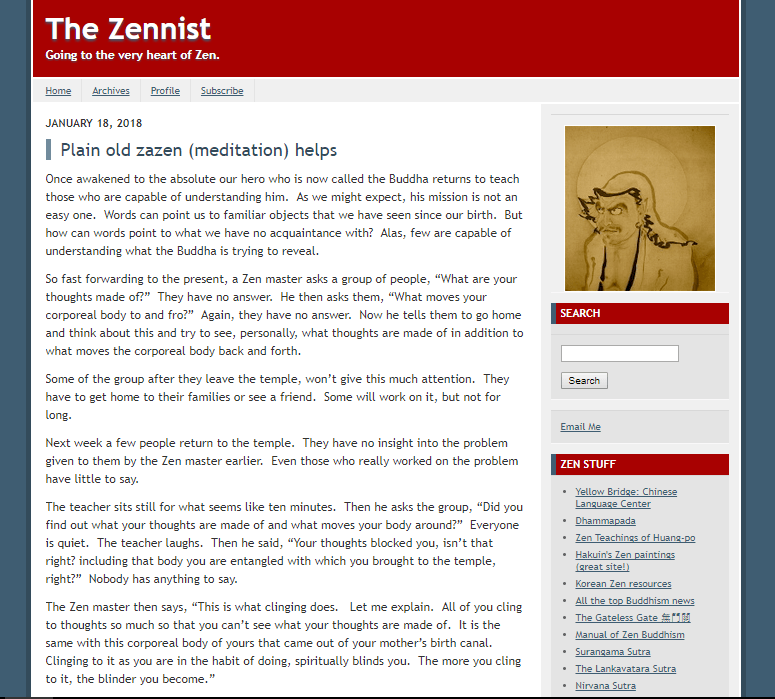 The Zennist is a frequently updated blog that features reflections on various aspects of Zen Buddhism, including meditation. Most of the posts are freewheeling reflections on Zen principles, often applied — or written in response to — current affairs and common challenges that we encounter in daily life. Posts are short but always thought-provoking; if you want frequent prompts to think deeper about your budding Zen practice, don’t miss this blog. If you’re wondering what a sustained Buddhist practice looks like, check out A Clear and Empty Mind. 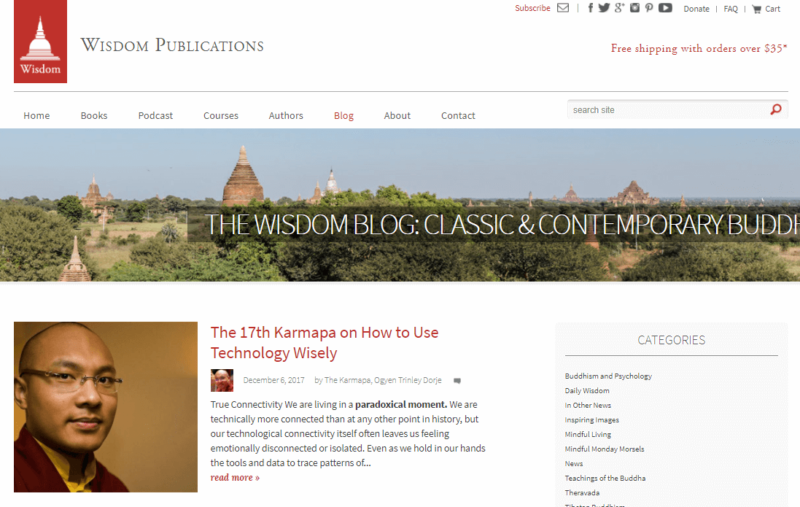 This is another blog where you’ll find Buddhist news, principles, and practices discussed through a personal lens. Lee, who runs the blog, comes from an eclectic background and emphasizes diverse perspectives on Buddhism. Most posts are written in an accessible, casual style, so it’s more like listening to a knowledgeable friend than consulting a guru. Most posts also take a non-sectarian approach, so this is a great read even if you’re not interested in Buddhism as a philosophy or spiritual practice.